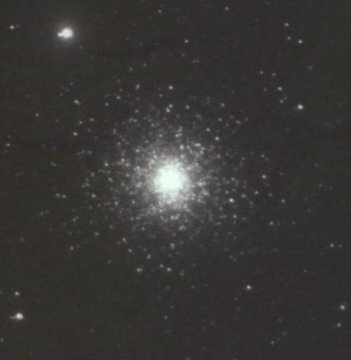 The globular cluster Messier 15 in Pegasus, not visible to the naked eye, provides a fine contrast to visually brighter Messier 13. Thirty-four thousand light years away, 70 light years across, even more massive than Messier 13 (550,000 solar masses), it is one of the most compact, centrally condensed clusters known, and is suspected of harboring a medium-mass black hole. Nearly 12 billion years old, it has an iron content (compared to hydrogen) just one percent of that of the Sun. University of Illinois Prairie Observatory.